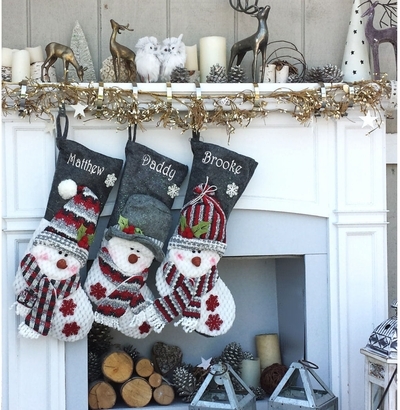 21" Christmas Stockings in Modern Burgundy Grey White color tones! Snowman will decorate any house and plenty big to hold lots of presents for the kids and adults alike. Choice of different designs so you can make a set. Materials: Authentic wool and polyester fleece and soft felt Christmas stocking. Measurements: This stocking measures 21" long along the diagonal from the top of the cuff to the toe; and the width across the cuff is 7 and 3/4". Personalized: Names can be personalized on the cuff of this modern Christmas stocking. Check our other stockings, we have other knit stocking designs if you like to mix and match into a set. PERSONALIZATION: Personalized in gorgeous embroidery thread - see additional images for personalizing choices: Embroidery thread color and Embroidery font. We have picked perfectly matching thread colors.